Welcome to Part 4 of our Annual Report Financial Analysis. At the end of this series I will share the spreadsheet used throughout the exercise which will include all of the formulas to calculate the ratios and on which statement to find the values to populate. The shareholder value analysis will go over some of the more widely used valuation measures used by shareholders of common stock. It is important to note that many of the shareholder valuations are calculated using the amount of outstanding shares. Results can be manipulated by decreasing or increasing the number of shares through buybacks or new share issuance. Book Value – Is the minimum asset value of a company. Book value is calculated subtracting Total Liabilities from Total Assets. This value can be further defined by dividing the Book Value by the Number of Outstanding Shares to provide a Book Value per Share. If a book value per share is below its stock price it may represent a value opportunity. Dividends – An amount that a company returns to shareholders in the form of cash for investing in their company. Dividends are usually displayed as a Dividends per Share value and also expressed as a yield percentage. Another measure of dividends popular among investors is dividend growth or the ability of a company to increase dividend payouts to shareholder. There are two ways to measure growth, the first is based on pure total dividends paid and the second is based on dividends per share. What is the difference? The later can change dramatically based on the number of outstanding shares. Which company looks to be the better value? 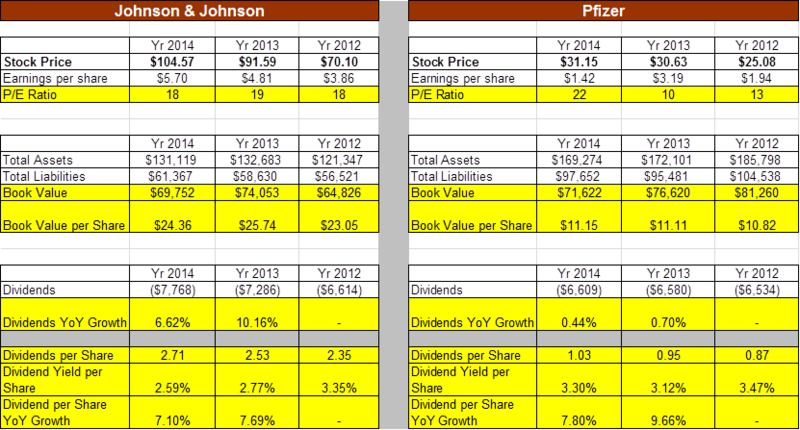 Johnson & Johnson (JNJ) maintains a better and more consistent P/E. Pfizer (PFE) has a stronger book value. Both have similar dividend per share YoY growth rates but the real difference lies within the actual dividend paid. PFE’s actual dividends paid only increased 0.44% and 0.77% in 2014 and 2013. So how can their dividend per share growth be so much larger? The answer to a larger portion of the increases is due to the massive share buybacks. By reducing the number of shares available they are artificially generating growth. The other contributor to their dividend growth was increasing the percentage of income allocated towards dividend payments. Considering from our earlier analysis that PFE had a Return on Assets of only 5% during 2014 it beckons the question if PFE is adequately spending their surplus cash in the best interest of shareholders. Due to these facts I would be concerned over how sustainable their continued Dividend per Share Growth Rate is going forward. In this round JNJ is the winner. There you have it, JNJ is our overall winner! I realize there were a lot of numbers and formulas and as promised to make this easier the spreadsheet used throughout is available for download and available on our Resources Page under Tools. DISCLAIMER: This analysis only evaluates the financial strength of a company and will not predict stock prices or speculation on where stock prices will go.